Here I have applied the drawing to the 140 lb. 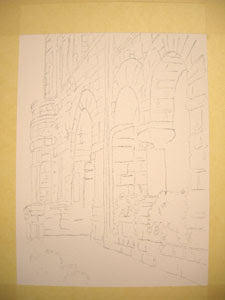 Arches paper, which is about 11 by 14 inches. I tape the paper to a foam core board and now I am ready to paint. 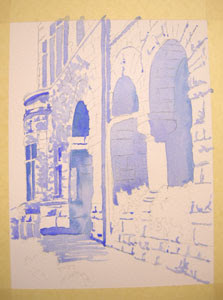 The first application of paint is done in French Ultramarine Blue. I begin to build the shadow areas that will become dark under-painting for the warm, dark values in the finished piece. As I discussed yesterday, if I under-paint with this relative opposite, it will darken the value without making the painting look dull or as if it was painted with too much pigment. My desire is to increase the value and maintain the transparency of the pigment.